I have to confess, I’m an emotion junkie—I live for dramatic moments. I will milk every last drop of sentimentality out of major milestones, especially the once-in-a-lifetime variety. My favorites are those long-awaited events, since they offer the best opportunities to anticipate and prolong my feelings. And boy, do I make the most of that anticipation! As the mother of school-aged children, I’ve been gearing up for one day in particular—high school graduation. I know such anticipation is shared by practically every parent of teenagers, but I claim a particular distinction. As my oldest child graduates from high school, the youngest of our four children also finishes fourth grade. This special day marks not only the completion of public education for one child, but the end of thirteen consecutive years at our beloved elementary school. The first time I watch a child leave high school. The last time I see a child say goodbye to elementary school. All in one day. And so it goes every time any discussion of graduation comes up. However, all that changed the day I made my usual remarks to the friend—who replied with an atypical observation. I had stopped by her vehicle to chat while our children practiced their piano pieces for an upcoming recital. Leaning against the car window as we waited in the church parking lot, I got a private lesson of my own. She was right. How I could enjoy the happiness of today if all I thought about was the sadness of tomorrow? I thought I could forestall my grief by talking about it all the time, when in truth I could only intensify it. My constant prediction of uncontrolled hysteria would become its own self-fulfilling prophecy. I must choose how I will spend this precious time. I can waste it regretting the end of a season, or rejoicing over new beginnings. I can mourn . . . or celebrate. I can anticipate sorrow . . . or joy. The decision is mine. Now, before you dismiss me as one who speaks with the foolish optimism of a first-time senior mother, let me explain that I am already well-acquainted with grief and its guerilla tactics. As much as we brace ourselves for it, often it ambushes us when we are least prepared. I expect to get blindsided unexpectedly: when I head to her room to wake her for school and see the empty bed, or forget to set one less place at the dinner table. I get it. I just don’t want to start stocking up on Kleenex and sympathy just yet. My daughter is leaving, and I expect to miss her. Because I am an emotional gal, I predict there will be tears. 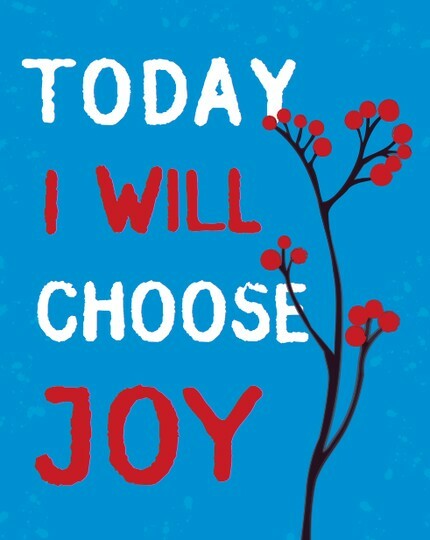 But for now, at least for today, I choose to anticipate joy. I hopped to your blog via Unglued and I love your writing style! Also you eloquently describe my two big struggles in this and your chicken little post. Thank you for sharing these slices of life. May God continue to bless and guide you during the Unglued OBS journey. Thank you so much! I hope you will continue to subscribe; I try to post once a week or so. Anyone built a vertical garden?We are thinking of installing a vertical garden, like the ones by Patrick Blanc eg. Pershing Hall, and were wondering if anyone has an idea of the internal make up of these sttcruures, including materials and irrigation system? Great amazing effects the following. I m fantastically contented to peer your article. Express gratitude which you lot and i’m looking advance to contact an individual. Willpower an distinctive entertain lessen me a e-mail?